Sausalito Floating Homes are an exciting opportunity to experience waterfront living, just 10 minutes from San Francisco. From the moment you arrive you will be transported by the beauty of the sea and glorious sunsets, and by the welcoming people of this wonderful community of floating homes. Life isn't the same when you're surrounded by water. Remote from the mainstream, yet only minutes from the city, you are transported to an atmosphere all your own. The pace is slower and your troubles are left behind. 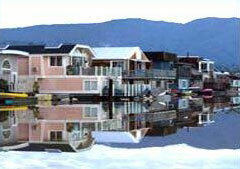 Contact Rachelle at Marin Water Views for a tour of houseboat community in Marin County.